Today we started our trip to France by getting a ride to Logan Airport in Boston with Tom's father. We got checked in OK, bikes taken away into the back. We were wondering if we'd ever see them again. We had a lot of time to kill because we were very early. Luckily we were able to sit in the Lufthansa Club since we were flying First Class. Nice benefit for all that traveling for work. There was some pretty good food in there as we were eating Lobster sandwiches and drinking beer and soda all we wanted. Here's a quick video snippet showing what the First Class Cabin was like. Sorry for the poor quality, just didn't have good resolution on the camera. The stewardess on the flight was named Carmen and was the best ever. She took good care of us and made the flight even more enjoyable. When we landed in Munich, there was a light fog in the valleys which made the well landscaped farms and little German towns look amazing contrasting the red roofs with the green countryside. When we got to Marseille, I found it interesting that we got off the plane and wandered into the terminal thorough what looked like an airplane hanger. It took a couple minutes to get our bikes, but sure enough, out they came. 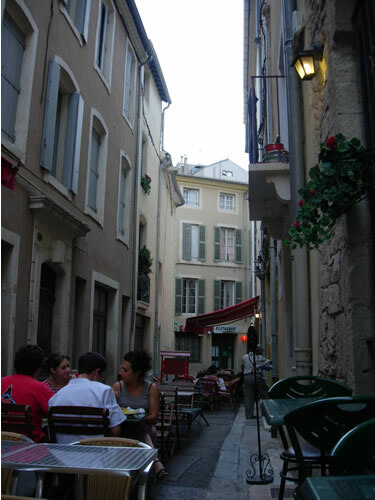 Next we got our rental van and started the trip to Nimes where we were staying at the Best Western L'Orangerie Hotel. Pretty nice and Tom was able to convince the owner to let us leave our bike boxes in their pool utility shed like we had been told we could. Interesting discussion when we don't speak French and they didn't speak English! After putting our bikes together and taking a short test ride, we headed into town to find some dinner. 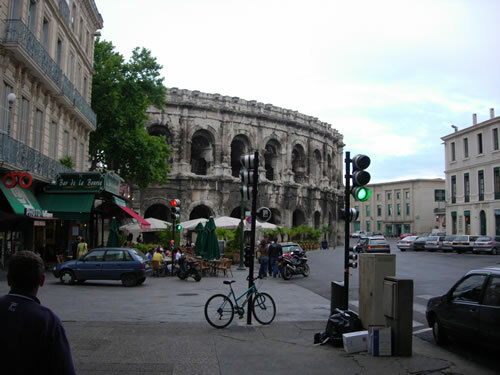 Nimes was an interesting place that was highly influenced by the Romans. We drove around for a bit looking for a place to park and ended up eating pizza at a little pizza place down an alley. The pizza was good and we'd end up coming back here at the end of our trip. Along with the heavy Roman influence, of course there was a mini coliseum. 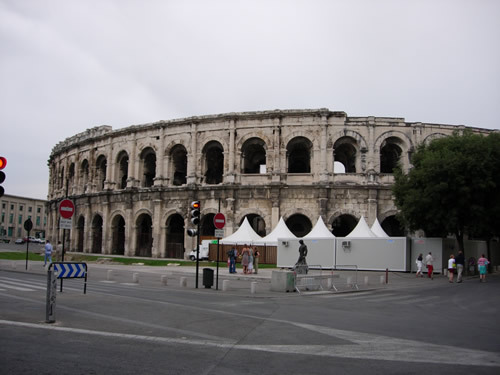 I believe that this may be the oldest coliseum remaining in France. You can see a couple pictures below. 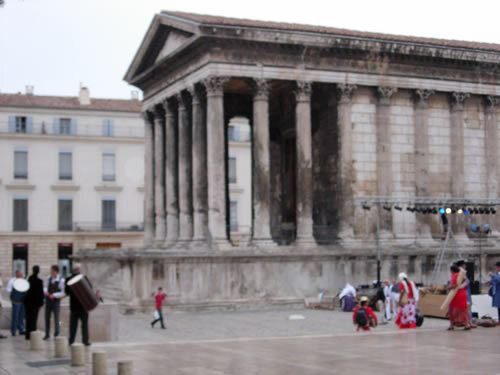 The final thing we saw in Nimes before returning to the hotel was another Roman Artifact. I can't remember now how old this building was, but it was very old. You can see some street player and a little stage on the right side. By this time, we were all pretty tired as you can only get so much sleep on airplanes so we retired to our little room, tried to watch the Tour de France on the little TV. Soon we all went to sleep as we had an early wake up the next morning to drive to the Alps! 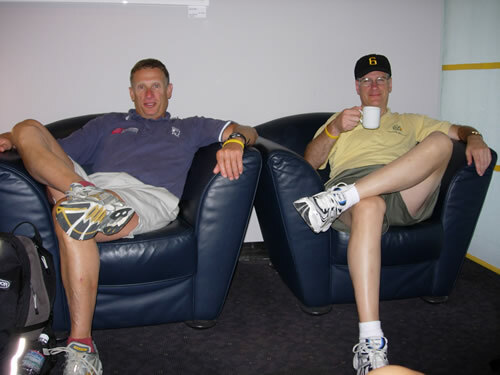 Here's a picture of Paul and I lounging in the Lufthansa Club waiting for our flight. Once we got on the plane we were happy to find it was unbelievably luxurious. 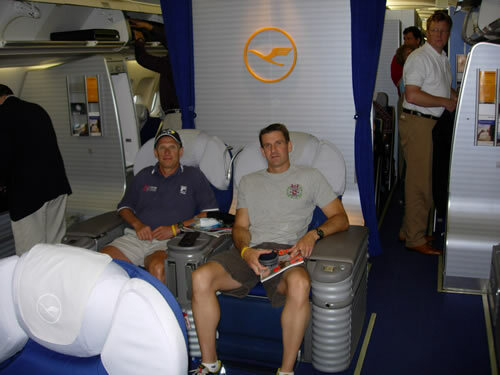 To this day, this flight from Boston to Munich Germany was the best flight I have ever taken. Below there are pictures of our seating. 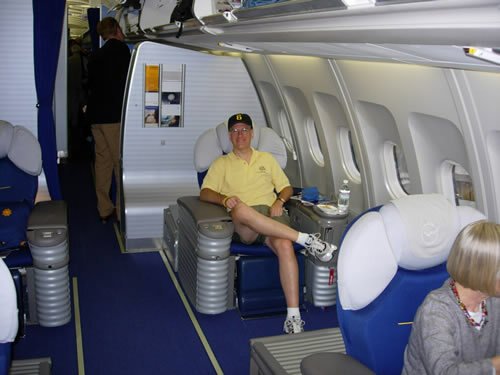 These seats opened into almost full beds with partitions so you could get rest on the flight. I had a Cabernet with the main course which I had Duck with Blueberry Sauce and a salad with Champaign vinaigrette. Desert was a mouse and some sort of Raspberry drink. On top of that, there was eating for the entire trip! Very nice, good thing we were burning calories the next couple weeks.